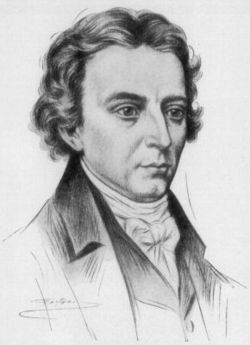 Robert Southey (August 12, 1774 – March 21, 1843) was an English poet and writer of the Romantic school. Southey was intimately linked to all the major figures of English Romantic poetry; he was a close friend and neighbor of William Wordsworth, and attended college with Samuel Taylor Coleridge. Ironically, however, for a man so intimately connected to poetic developments in England, Southey never achieved major success as a poet. Although he wrote a number of poems which critics consider very successful, and although he was most certainly talented, Southey's poetry suffered from excessive mythologizing and allusion, at the expense of poetic clarity. Ironically, Southey's fame now rests not on his poetry but on his prose. Although many of Southey's contemporaries (including, eventually, Coleridge) would voice their doubts about his talents as a poet, Southey's genius for prose-writing was never questioned even by his severest critics. As a close friend and confidante to so many important poets and writers of his generation, Southey's prolific prose work and correspondence is an invaluable record for one of the most important eras in English poetry. Moreover, Southey wrote a number of non-fiction books, many of which are still popular today, including biographies of Admiral Lord Nelson, John Bunyan, and John Wesley, and a historical study of Portugal and Spain where Southey rather famously "thanked God [he was] an Englishman." A master of the essay and an accomplished if not spectacular poet, Southey is an invaluable witness to the historical and literary developments of the early nineteenth-century who not only recorded the Romantic movement but also played a critical part in it. 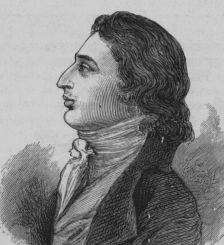 Southey was born in Bristol to Thomas Southey, a linen draper, and Margaret Hill, although Southey spent much of his childhood in the care of his aunt Elizabeth. Southey was educated at Westminster School in London, but was expelled after writing an article (published in the school periodical) that criticized the school's practice of excessive whippings. After his expulsion, Southey's youthful political sentiments turned markedly radical; he became a rather vocal champion of the French Revolution and began writing an epic poem Joan of Arc (published in 1796) that expressed his enthusiasm for democratic revolution and radical politics. Southey entered Balliol College, Oxford, in 1792, shortly after his father's death and bankruptcy. Of his time at Oxford, Southey was later to say "All I learnt was a little swimming ... and a little boating..." At Oxford, Southey did, however, meet Coleridge, who at the time was also a young man who burned with political fire and had a weakness for poetry. The two collaborated on a verse drama The Fall of Robespierre that was completed the same year, though both men would later distance themselves from the juvenile work. Their wants would be simple and natural; their toil need not be such as the slaves of luxury endure; where possessions were held in common, each would work for all; in their cottages the best books would have a place; literature and science, bathed anew in the invigorating stream of life and nature, could not but rise reanimated and purified. Each young man should take to himself a mild and lovely woman for his wife; it would be her part to prepare their innocent food, and tend their hardy and beautiful race. In 1795 Southey married Edith Fricker, and, shortly thereafter, Coleridge married Edith's sister, Sara Fricker. The two poets, now brothers-in-law, continued to plan quite seriously to develop their utopian community, having convinced several other friends to join the project. Shortly thereafter in the same year, however, Southey began to have his doubts; he suggested the community be moved from America to Wales, and then, shortly thereafter, completely backed away from the plan, calling it "unworkable." Without Southey's enthusiasm the utopian plan collapsed, and for a time Coleridge and Southey's friendship suffered as a result. Thereafter Southey traveled with his uncle, who was the British chaplain in Lisbon, to Portugal and Spain. He would remain there nearly two years, and publishing his first major prose piece, Letters Written During a Short Residence in Spain and Portugal in 1797. The book was quite a success, and Southey followed it up with the publication of the second version of collected Poems in 1799 (the first version, published during his college years with Coleridge, had not received nearly as much attention). Supported financially by Charles Wynn, a college friend, Southey returned to England determined to make his living as a poet and writer. Beginning in 1800, Southey entered the most successful period of his career. He became a regular contributor to a number of periodicals and newspapers; he did a number of volumes of translations, principally from Spanish and Portuguese; he edited the complete works of Thomas Chatterton; and he also published two epic poems Thalaba the Destroyer (1801) and Madoc (1805) which gained positive reviews in his time, though they are almost completely unread today. In 1803 Southey visited Coleridge, who was living at Greta Hall, Keswick, in the Lake District. Coleridge's home was only a short walk from Wordsworth's. The two "Lake Poets" were at that time at the height of their creative output, and Southey was so impressed with his friend (and with the stunning countryside of the Lake District) that he decided to stay. Southey would live at Greta Hall for the rest of his life, partly so that Edith and Sara Fricker could remain together and partly because he wished to participate in the poetic activity he had discovered in the Lake District. Southey became fast friends with Wordsworth, and contributed poems to their growing Romantic movement. Starting in 1809 Southey produced a prolific amount of prose, partly out of necessity; the expenses of Greta Hall proved to be quite steep, and Southey struggled to produce enough work to pay the bills. He began contributing to the Quarterly Review—the major publication for emerging poets in England. By 1813 Southey's fame as a poet had grown to such proportion that he was appointed as poet laureate. In 1819, through a mutual friend, Southey met leading civil engineer Thomas Telford and struck up a strong friendship. From mid-August to October 1, 1819, Southey accompanied Telford on an extensive tour of his engineering projects in the Scottish Highlands, keeping a diary of his observations. This was published posthumously in 1929 as Journal of a tour in Scotland in 1819. The volume offers a fascinating glimpse at England's rapid industrialization from the point of view of a self-professed "poet of nature." By this time Southey's political opinions had completely changed from his early radicalism; he had become a devoted Tory and despised the French Revolution and the ensuing chaos it had caused. Southey's reputation among some of his poets suffered because of his conservative views, and in the early 1810s matters came to a head when Southey and the poet Lord Byron became involved in a long public quarrel. Byron dedicated the first cantos of Don Juan, his great satire on hypocrisy, to Southey. Southey responded by publishing a poem, A Vision of Judgment which decried Byron and the flamboyant poets like him as belonging to the "Satanic school" of poetry. Byron immediately rebutted by publishing a masterful satire of Southey, entitled The Vision of Judgment. The quarrel with Byron was sadly never resolved, and the ugliness displayed on both sides tarnished Southey's late reputation and distracted him from accomplishing poetic work that might have been of higher merit. In 1838, Edith died and Southey married Caroline Anne Bowles, also a poet. By this time, however, Southey's health was already failing, and his productivity had come to a stand-still. He died in relative obscurity in 1843. That was so large and smooth and round. The ploughshare turns them out. I could not well make out. "Why 'twas a very wicked thing!" "It was a famous victory. The Doctors (1834) – Includes the first published version of the fairy tale-like "Goldilocks and the Three Bears"
This page was last modified on 15 July 2015, at 16:17.